I wanted to make a drag bike to compete in the D/Pro Bike class here in New Zealand. Here are the rules of this class that affect how I had to build this bike. 2…Wheelbase may be increased to a maximum of 20% from stock. 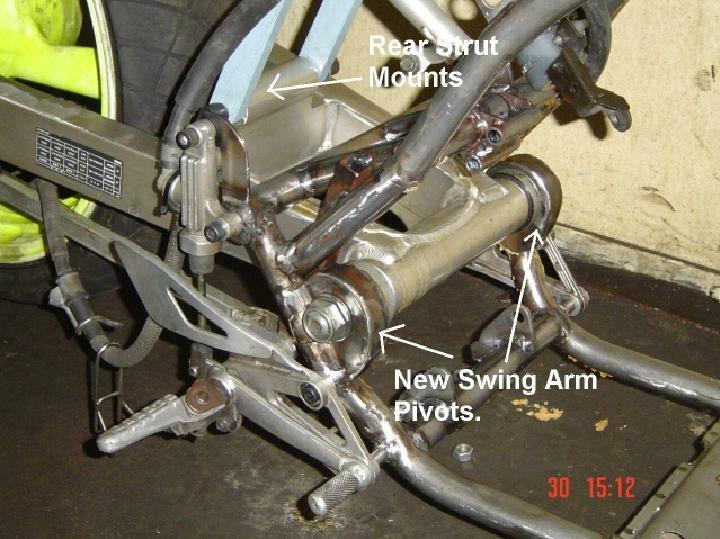 3…Swing arm pivot must be retained and swing arms must not be welded to the frame. 4… Ground clearance must be 50mm minimum with rider on bike. 5…Handlebars must be mounted in the stock location. Clip on bar allowed only where factory original. I found a TZR250 rolling chassis for a good price and this gave me a much more up-to-date front end and rear. So I am going to use the TZR front wheel, rear wheel,swing arm,subframe,front and rear brakes and the front forks. Plus the donor RD400 chassis. First thing we need to do is make up a jig to keep the wheelbase and ground clearances correct. I made one by punching out some 3mm plate steel on a CNC Turret press. This will keep the front and rear axles parallel and correctly spaced for wheelbase and ground clearance. It also has holes to fit the swingarm pivots to keep them parallel to the axles. So now we have the jig we can try fitting the swing arm and forks. Here is the swing arm in the jig. It will be turned upside down and the bracing cut off. That way the shock pivot mount will be in the correct place to take my strut bars. Now we have to put the frame in and figure out how and where to cut it to fit the swing arm and to raise the steering head plus rake it. 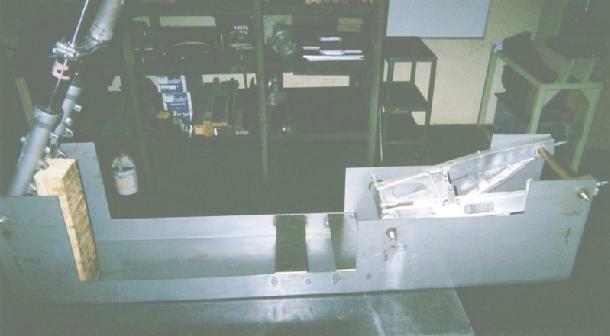 The steering head has to be moved up as the whole frame is lowered to 3 inches off the ground. You cannot just push the forks up through the triple clamps as you would end up with the forks "topping out" on the lower triple clamp. The frame also has to be cut because the swing arm is wider than the original. So after heaps of drawing , measuring and mucking about we cut the steering head off and added some bracing. 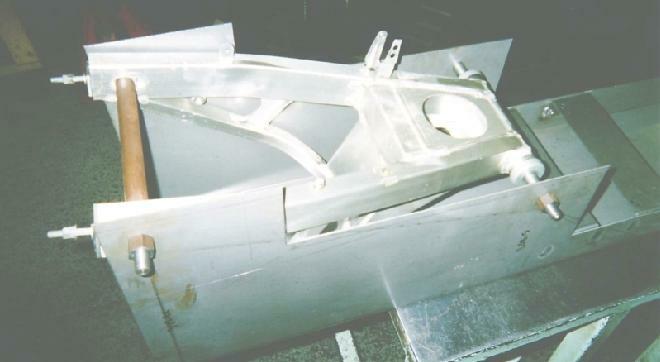 Also cut the sub frame off and fitted the TZR sub frame. It fitted very well and matched up with RD frame in the lower mount. 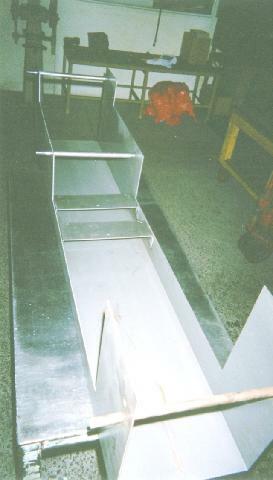 The frame was heated up and widened at the swing arm pivot area. New pivot points where made and welded. Frame has had swing arm mounts widened and steering head relocated to give a rake of 37 degrees.Wheel base is set at 1580mm and ground clearance is 75mm. Also I have fitted the TZR rear sub frame.